Enjoy a night out in the West End! Start your night at Pizza Express with a wonderful Italian meal. Our automatic table reservations mean no worries about timing and a comfortable 5-minute walk will bring you to the Fortune Theatre where you’ll come face to face with The Woman in Black. Pizza Express has a full menu of homemade pizzas, pastas, salads and more. Make sure you build up your strength, you’ll need it to stand up to what has been dubbed the scariest show on the West End. An old man recounts the darkest chapter in his life to an actor, he hopes by re-enacting the past he might somehow exorcise it, but have the men seem to have got more than they bargained for. The Woman in Black has been holding audiences captive for more than 30 years, don’t miss your chance to live through the most terrifying even in live theatre. 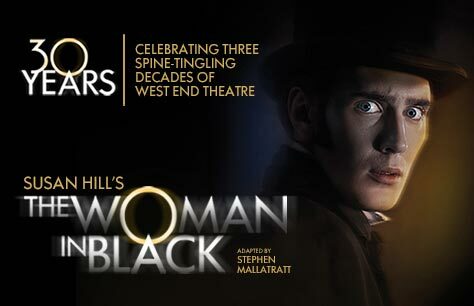 Dinner and Show tickets are now available for The Woman in Black with a free meal at Pizza Express! Book now to get this monstrously good deal while it lasts.